This past year at the National Restaurant Association, we unveiled a new line of décor from Bauscher called Vintage Tiles. It is overlaid in five different patterns on Noble China Purity, with coupe plates, deep coupes, and rectangular share plates all available. Each of the five styles is inspired from actual vintage tiles that provide an air of antiquity to each course they contain. Even better, BauscherHepp requested these décor patterns match colors from our Nara stoneware items in the Playground collection. From left to right, Antique Cinnamon and Antique White Pepper patterns were created with a Moorish flair. Imagine sitting on a patio overlooking the Mediterranean eating off plates that had been bleached over the centuries. The Antique Sea Salt décor also has a used and well-worn look, but in a much cooler way. with blue-grays and an air of elegance, it's easy to get lost in the charming yet imperfect patterns that emerge. With what might be the most worn-out look, Antique Mokka provides a hint of arabesque browns that eventually fade to parts of the plate where it's almost invisible. Mokka was designed to encourage new, unfamiliar food presentations. Finally, the Antique Olive pattern will remind you of vines gently climbing an aging Italian wall somewhere in the countryside. The faded tapestry look inspires a Mediterranean ambiance that is ideal for fresh food presentations. The Vintage Tiles Collection from Bauscher is now available from BauscherHepp. 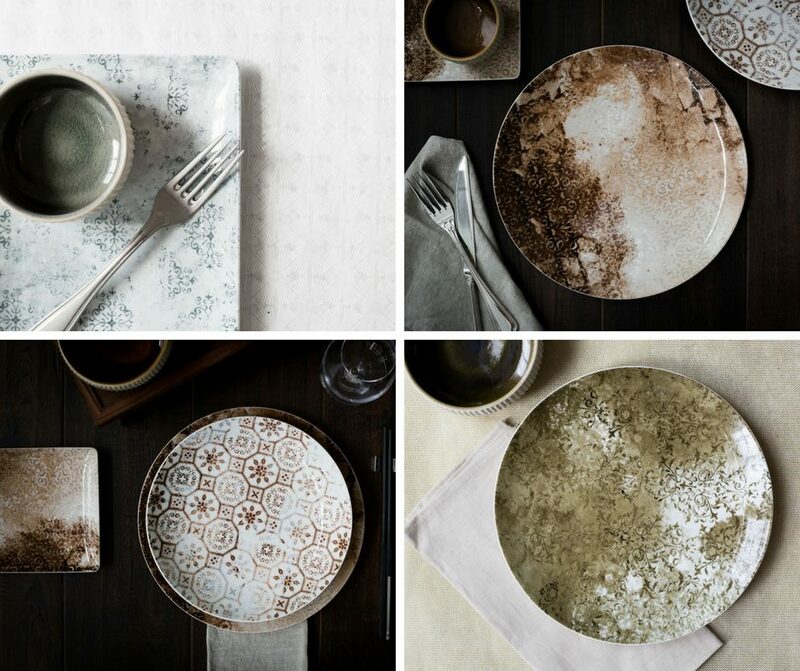 Be sure to check out samples to see how these unique patterns can add an air of antiquity to your dinning room.